If there's anything you should know, it's that I love cheesy television, and frankly, I don't care who judges me for it. Whether it was Dawson's Creek in the early 2000s or One Tree Hill now, they're some of my guiltiest pleasures and I make no excuses for it. So yeah, I admit to being a little giddy as my dad pulled into historic Downtown Wilmington, and there was perhaps a little inside squee. Or, it could have been aloud, and under my breath, acutely aware that there were others around me. 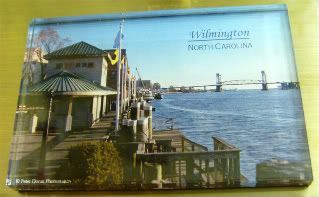 But, I couldn't help it - these familiar streets, storefronts, and the Riverwalk (on this magnet) have been such a big part of my WB/CW television-viewing history - from the Capeside regatta that Pacey totally won, or to Nathan and Haley and their little friendship bracelet, studying by the water. Doesn't matter that I've been down there several times before, that I've touched Pacey's locker, been to the Potter B&B, drove down the bend where Pacey first kissed Joey, on both friend tours and the EUE Screen Gems tour several years ago. I was still silly, walking around town, with various scenes playing in my head this afternoon. Truly, the town's basically become a backlot for both shows. It was fun, hanging out with my dad, roaming around town. He'd never been to Riverwalk, and was truly surprised to see the USS North Carolina moored on the opposite bank. As for me, I was surprised the ship was blue...but I was even more surprised to find out that the River Court actually exists! For years, I've thought that One Tree Hill was green-screening the court with the riverfront background! Weird. I'll tell you what, after walking the three square blocks of Capeside and Tree Hill, just looking for someone who would have fried fish for my dad, I was desperate for Leery's Fresh Fish, right around the corner on the water. Instead, we ended up at a restaurant endorsed by both Food Network magazine & OTH cast as one of the best places to eat in town. My dad would have been happier at Captain D's. I'd have been happier at Pacey's locker.